During his first voyage, Gulliver is washed ashore after a shipwreck and finds himself a prisoner of a race of tiny people, less than 6 inches (15 cm) tall, who are inhabitants of the island country of Lilliput. After giving assurances of his good behaviour, he is given a residence in Lilliput and becomes a favourite of the Lilliput Royal Court. He is also given permission by the King of Lilliput to go around the city on condition that he must not hurt their subjects. Gulliver in discussion with Houyhnhnms (1856 illustration by J.J. Grandville). It is uncertain exactly when Swift started writing Gulliver's Travels. (Much of the writing was done at Loughry Manor in Cookstown, County Tyrone, whilst Swift stayed there.) Some sources[which?] suggest as early as 1713 when Swift, Gay, Pope, Arbuthnot and others formed the Scriblerus Club with the aim of satirising popular literary genres. According to these accounts, Swift was charged with writing the memoirs of the club's imaginary author, Martinus Scriblerus, and also with satirising the "travellers' tales" literary subgenre. It is known from Swift's correspondence that the composition proper began in 1720 with the mirror-themed Parts I and II written first, Part IV next in 1723 and Part III written in 1724; but amendments were made even while Swift was writing Drapier's Letters. 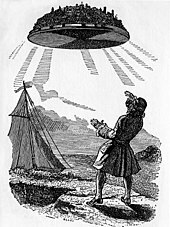 By August 1725 the book was complete; and as Gulliver's Travels was a transparently anti-Whig satire, it is likely that Swift had the manuscript copied so that his handwriting could not be used as evidence if a prosecution should arise, as had happened in the case of some of his Irish pamphlets (the Drapier's Letters). In March 1726 Swift travelled to London to have his work published; the manuscript was secretly delivered to the publisher Benjamin Motte, who used five printing houses to speed production and avoid piracy. Motte, recognising a best-seller but fearing prosecution, cut or altered the worst offending passages (such as the descriptions of the court contests in Lilliput and the rebellion of Lindalino), added some material in defence of Queen Anne to Part II, and published it. The first edition was released in two volumes on 28 October 1726, priced at 8s. 6d. Each part is the reverse of the preceding part—Gulliver is big/small/wise/ignorant, the countries are complex/simple/scientific/natural, and the forms of government are worse/better/worse/better than Britain's. 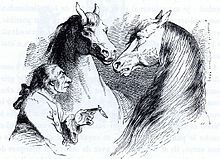 Of equal interest is the character of Gulliver himself—he progresses from a cheery optimist at the start of the first part to the pompous misanthrope of the book's conclusion and we may well have to filter our understanding of the work if we are to believe the final misanthrope wrote the whole work. In this sense, Gulliver's Travels is a very modern and complex novel. There are subtle shifts throughout the book, such as when Gulliver begins to see all humans, not just those in Houyhnhnm-land, as Yahoos. 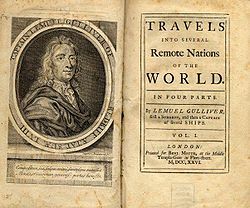 However, a feminist perspective of Gulliver's Travels argues that it is misogyny, and not misanthropy, that is shown in Gulliver. Though Don Pedro appears only briefly, he has become an important figure in the debate between so-called soft school and hard school readers of Gulliver's Travels. Some critics contend that Gulliver is a target of Swift's satire and that Don Pedro represents an ideal of human kindness and generosity. Gulliver believes humans are similar to Yahoos in the sense that they make "no other use of reason, than to improve and multiply...vices"  Captain Pedro provides a contrast to Gulliver's reasoning, proving humans are able to reason, be kind, and most of all: civilized. 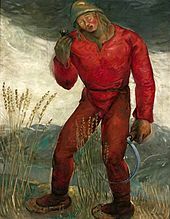 Gulliver sees the bleak fallenness at the center of human nature, and Don Pedro is merely a minor character who, in Gulliver's words, is "an Animal which had some little Portion of Reason". 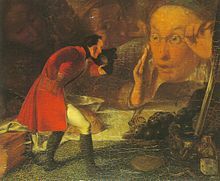 Gulliver and a giant, a painting by Tadeusz Pruszkowski (National Museum in Warsaw). The television series Land of the Giants seems inspiredby the second part of the novel, as seven Earthlings go through a space warp and end up on a planet similar to Earth but everyone and everything is twelve times normal size. Gulliver's Travels (1939): Max Fleischer's animated feature-length classic of Gulliver's adventures in Lilliput. This was the second animated feature film made by an American studio (Walt Disney's Snow White and the Seven Dwarfs was the first). The film was spun off into two cartoon short series: the Gabby cartoons about a Lilliputian sidekick of the film, and the Animated Antics cartoons starring Sneak, Snoop and Snitch (the three villains) and Twinkletoes (the carrier pigeon). The standard edition of Jonathan Swift's prose works as of 2005[update] is the Prose Writings in 16 volumes, edited by Herbert Davis et al. ^ Swift, Jonathan (2009). Rawson, Claude, ed. Gulliver's Travels. W. W. Norton. p. 875. ISBN 978-0-393-93065-8. ^ Gay, John. "Letter to Jonathan Swift". Communion. Communion Arts Journal. Retrieved 9 January 2019. ^ "The 100 best novels written in English: the full list". Retrieved 17 Aug 2015. ^ Case, Arthur Ellicott (1945). Four essays on Gulliver's travels. Gloucester, Mass: P. Smith. ^ e="Project Gutenberg"> "Project Gutenberg". ^ a b c d e "Project Gutenberg". ^ Daily Journal 28 Oct 1726, "This day is published". ^ Swift, Jonathan (1980). Isaac Asimov, ed. The Annotated Gulliver's Travels. New York: Clarkson N Potter Inc. p. 160. ISBN 0-517-539497. ^ Allan Bloom (1990). 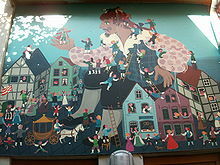 Giants and Dwarfs: An Outline of Gulliver's Travels. New York: Simon and Schuster. pp. 47–51. ^ a b 1667-1745., Swift, Jonathan,. Gulliver's travels : complete, authoritative text with biographical and historical contexts, critical history, and essays from five contemporary critical perspectives. Fox, Christopher, 1948-. Boston. ISBN 9780312066659. OCLC 31794911. ^ Rogers, Katharine M. (1959). ""MY FEMALE FRIENDS": THE MISOGYNY OF JONATHAN SWIFT". Texas Studies in Literature and Language. 1 (3): 366–379. JSTOR 40753638. ^ Armintor, Deborah (2007). "The Sexual Politics of Microscopy in Brobdingnag". JSTOR. JSTOR 4625129. ^ a b c d Case, Arthur E. “From ‘The Significance of Gulliver’s Travels.’” A Casebook on Gulliver Among the Houyhnhnms, edited by Milton P. Foster, Thomas Y. Crowell Company, 1961, pp. 139–47. ^ a b c d Crane, R. S. “The Houyhnhnms, the Yahoos, and the History of Ideas.” Twentieth Century Interpretations of Gulliver’s Travels: A Collection of Critical Essays, edited by Frank Brady, Englewood Cliffs, N.J., Prentice-Hall, 1968, pp. 80–88. ^ a b c d Stone, Edward. “Swift and the Horses: Misanthropy or Comedy?” A Casebook on Gulliver Among the Houyhnhnms, edited by Milton P. Foster, Thomas Y. Crowell Company, 1961, pp. 180–92. ^ Swift, Jonathan (1726). Gulliver's Travels. p. 490. ISBN 978-0-393-93065-8. ^ "Target: Deimos". 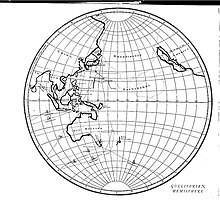 Gazetteer of Planetary Nomenclature. Astrogeology Research Program, USGS. Retrieved 28 Feb 2018. ^ "Target: Phobos". Gazetteer of Planetary Nomenclature. Astrogeology Research Program, USGS. Retrieved 28 Feb 2018. ^ "yahoo - definition of yahoo in English - Oxford Dictionaries". ^ Wiener, Gary, editor. “The Enthusiastic Reception of Gulliver's Travels.” Readings on Gulliver's Travels, Greenhaven Press, 2000, pp. 57–65. ^ a b c d Gerace, Mary. “The Reputation of ‘Gulliver’s Travels’ in the Eighteenth Century.” University of Windsor, 1967. ^ a b c Lund, Roger D. Johnathan Swift’s Gulliver’s Travels: A Routledge Study Guide. Routledge, 2006. ^ "Memoirs of the Court of Lilliput". J. Roberts. 1 January 1727 – via Google Books. ^ l'abbé), Desfontaines (Pierre-François Guyot, M.; Swift, Jonathan (1 January 1730). 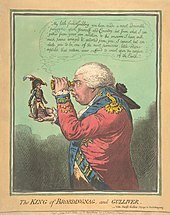 "Le nouveau Gulliver: ou, Voyage de Jean Gulliver, fils du capitaine Gulliver". La veuve Clouzier – via Google Books. ^ “About Some Queer Little People,” by Donald Grant Mitchell, St. Nicholas, Mar. 1874, 296–99. ^ a b Bleiler, E. F.; Richard, Bleiler (1990). Science-Fiction: The Early Years. Kent State University Press. pp. 400–401. ISBN 9780873384162. ^ Julien, Alexandre. "Soufferance Bandcamp page". Bandcamp. Abridged Pause Publishing. Retrieved 28 June 2015. ^ Pajukallio, Arto (10 August 2011). "Nuoren pyövelin tapaus". Helsingin Sanomat (in Finnish). pp. D 5. ^ "Gulliver a törpék országában (1974)". ^ "Gulliver's Travels". 23 November 1979 – via IMDb. ^ "Gulliver az óriások országában (1980)". ^ "Gulliver in Lilliput". 3 January 1982 – via IMDb. ^ "Gulliver's Travels (TV 1996)". Retrieved 26 November 2011. ^ "Tales of Gulliver's Travels » Sonar Entertainment". Sonar Entertainment, LLC. Archived from the original on 26 June 2015. Retrieved 12 January 2012. .
^ "Now, an Indian Gulliver's Travels". Sunday Tribune. 8 June 2003. Retrieved 13 November 2012. ^ "Chris O'Dowd: The IT Man From The IT Crowd". SuicideGirls.com. 9 May 2009. Archived from the original on 10 April 2012. Retrieved 11 May 2009. ^ Swift, Jonathan (2005). Rawson, Claude; Higgins, Ian, eds. Gulliver's Travels (New ed.). Oxford. p. xlviii. 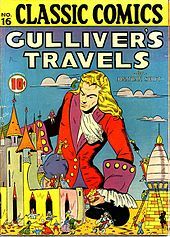 Wikimedia Commons has media related to Gulliver's Travels.